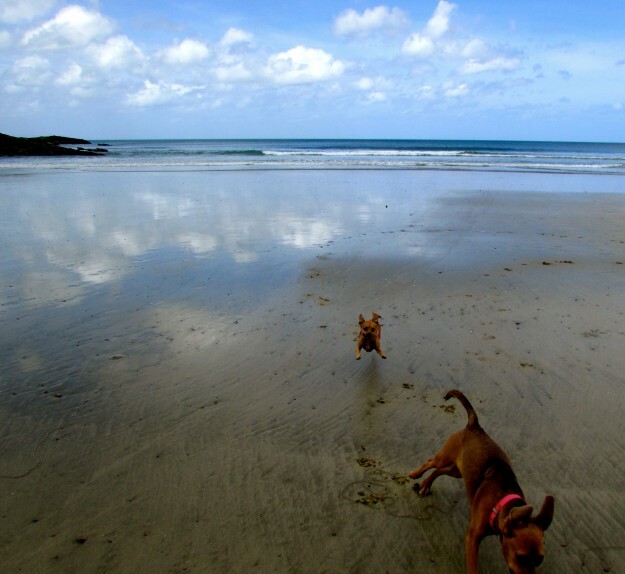 Maya and me running in the ocean. I’ll admit it, sometimes it’s fun to have a little sister! 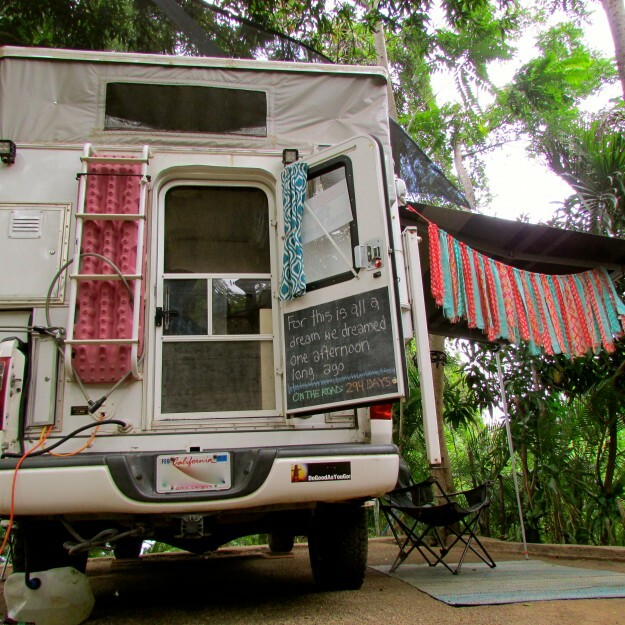 Although I was sad that we were leaving our overlanding friends and Costa Rica behind, I have to admit I was itching to get back on the road. The overlanding life is pretty good for us dogs. Since I don’t have fingers or a license, Jason never asks me to do any of the driving. I basically get to lounge on Victoria’s lap, snoozing away or stretching up to watch the beautiful countryside pass by. Almost as if Victoria had heard these thoughts, the drive to the border of Nicaragua started with a rather disappointing turn of events: I was thrust in the back seat of the truck! I guess now that My Family has set up a comfy perch for Maya back there they figured it would do okay for me as well. As if! Now I have to sit next to the puppy, without Victoria’s comfy lap supporting me during the bumps and bounces! Also, Maya is getting BIG! She takes up a lot of room, and she likes to chew on my legs and face. Definitely a downgrade. I was sure I’d find a way to squeeze back onto my princess perch in the front seat, but for now I just had to grin and bear it as we drove the steamy road up to the border. Crossing back into Nicaragua was no trouble at all, and thanks to a suggestion from our friends, I got to stay in the air conditioned truck the whole time with Maya and Victoria, while Jason handled all the paperwork. Much better than panting my little furry face off in the midday heat while kids whistle and snap at me. We drove back up the highway and into the town of San Juan del Sur, a pretty little beach community that Victoria had visited years ago, and was excited to see once again. We drove in a bunch of circles, striking out on places to stay, until a nice man that called us ‘chicos’ told us about a pretty beach just twenty minutes away that was great for dogs. Dog friendly beach? Now we’re talking! Pretty sure this is what doggie-Heaven looks like. 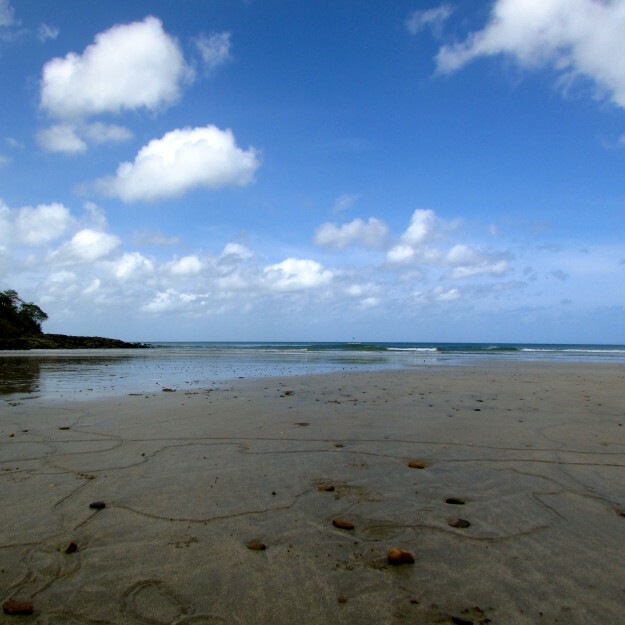 We drove the super duper bumpy road to Playa Maderas, and found that special beach our friend had suggested. We found a comfy place to park behind Cafe Revolucion, a small brick building that smelled of cheese and pepperoni, two scents that wrap around my heart. Yes, they do make pizza as well as coffee, and yes, I did get to try it during the week my family spent at this fantastic beach! I could chase Maya on the beach all day. Luckily, she seems to like being chased! Boy, what a beach it was! There were tons of dogs around, and since Maya is still pretty much afraid of everything that made off leash time a bit tricky. We did get to have some, however, which means my favorite past-time: chasing waves! I ran until I thought my heart would leap out of my chest, biting at the waves and charging at Maya in the sand. She’s become pretty good at this herself, but she’s much braver than me when it comes to going in the water. She even started swimming a little bit! I couldn’t let her show me up, so I tried to brave the waves myself. It’s not so bad, but I definitely prefer solid ground under my paws. Me, just taking it all in. That’s basically what life was like in this special place. My Family got to know some of the other Adventurers who were staying there, people from all over the world. I barked at all of the other dogs that tried to get close to the camper, and thankfully Maya has joined in these all important security duties. Victoria got back into speaking Spanish with the locals, and Jason had yet another bouncy ride in the back of a pickup truck, when the internet went down on the beach during one of his work days. This was after a crazy windstorm that blew out the power everywhere, and also blew away our wicker door mat. It was never to be seen again. Other than that bit of craziness, our time was spent slowly, eating delicious food, running on the beach, and taking in some of the coolest sunsets yet. I think I could have stayed here forever. 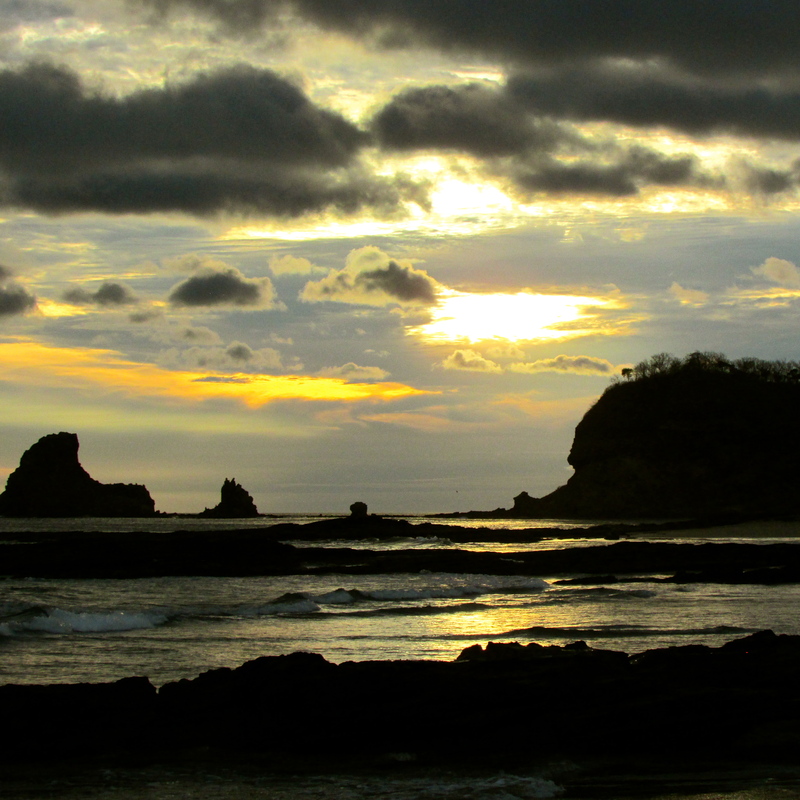 Gosh, I forgot how awesome Nicaragua was! Sunset on Maderas. Pretty sweet. Unfortunately, good internet access was not high on the priority list for the residents of Playa Maderas (that list basically reads: surfing, cheap beer, fish tacos, chocolate bliss balls and loud music), so once Jason’s work week came around again we headed back into San Juan del Sur. 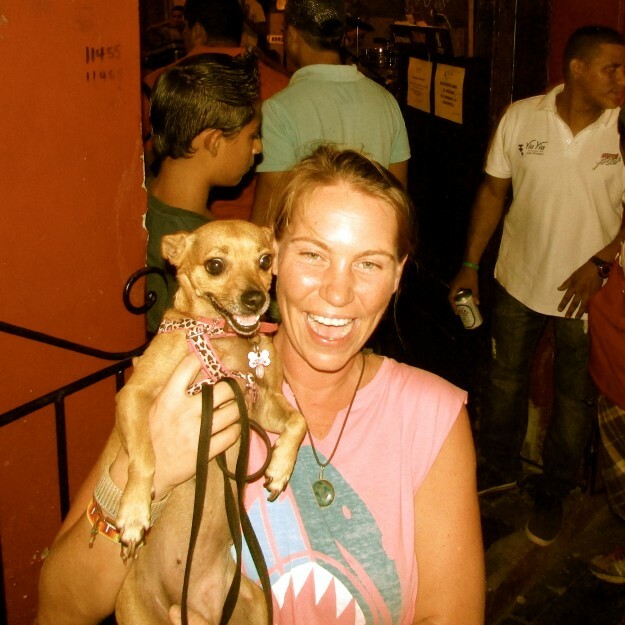 We had heard there might be a hostel there that loves dogs, and with a bit of searching we found Hostal Suenos del Mar. I was immediately happy we did, because the owners LOVED me. Sure, they gave Maya that puppy attention, but they knew I was the star of the show. They showed us a great room, with a huge bed and chilly floors that was absolutely perfect. So Jason parked the Big Truck outside, we unpacked and got ready to check out the town. Before we got out the door, we ran into our friend Amelie, a super nice human we had met months ago in Guatemala. It was pretty cool getting to catch up on her Adventures, with months spent in El Salvador and other cool places. 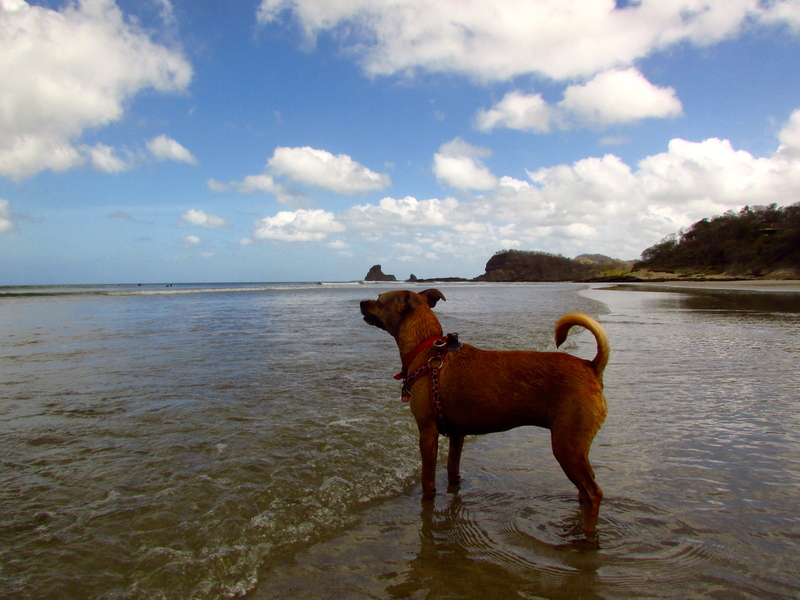 We spent several days in San Juan del Sur, and Maya and I got to walk around every bit of it with Victoria and Jason. Most people there are super nice to dogs, so we got to go in all the restaurants. It’s a really pretty town, but way busier than the beach. We stayed just long enough for Jason to get the Big Truck’s brakes worked on again (he was worried about all of the mountains we’d see in Guatemala, and a nasty squeak had developed over the past week), and then packed up and headed north. It felt like we were moving really fast through Nicaragua, but I guess My Family had big plans in mind for other spots along the way. After all, this was our ‘return trip’. The biggest part of the Big Adventure was through, and we had to keep moving. I sure hoped we’d be able to slow down at some point! 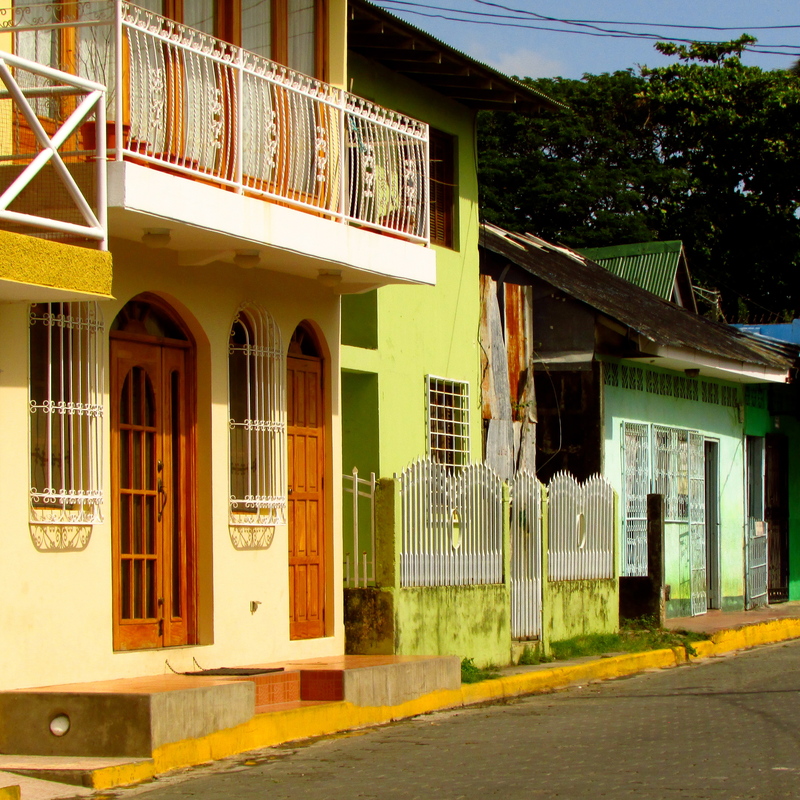 San Juan del Sur is full of colorful buildings, dirty backpackers and amazing things to smell. 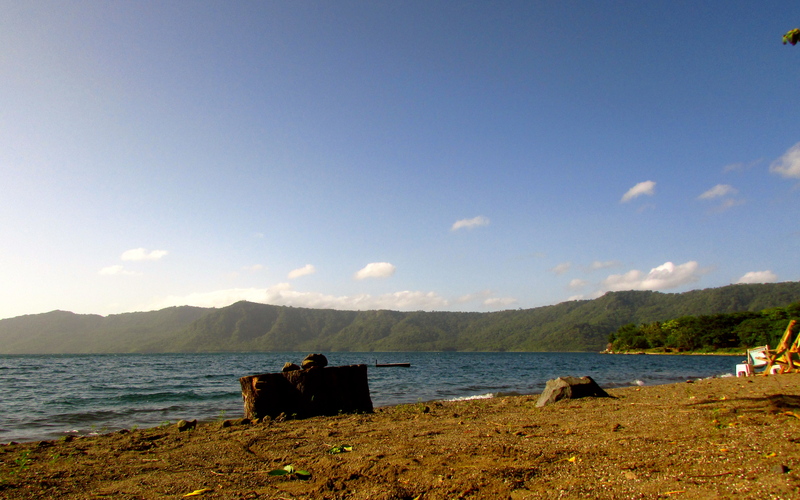 Luckily, we did just that at our next stop: Laguna de Apoyo. We went right back to Hostal Paradiso, a spot My Family had really loved on our trip south. 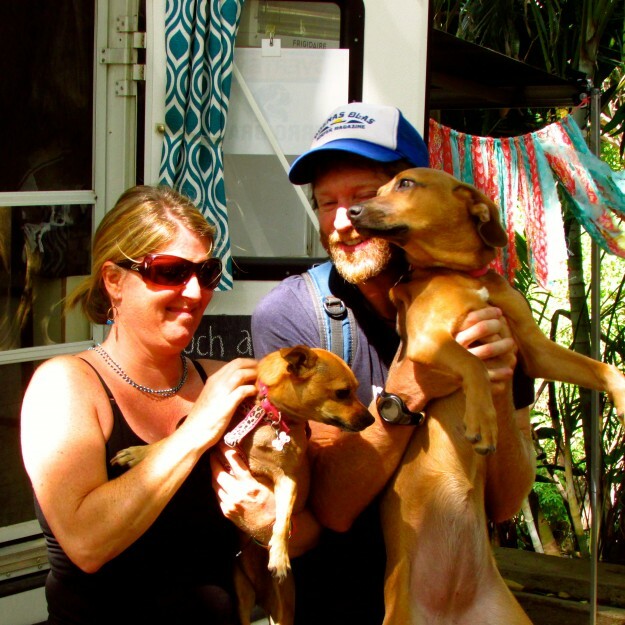 The owners were super happy to see us again, and we even got our same camping spot back! We went right down to the lake to relax under the Rancho, and relaxing is basically all we did for the next week! The temperature on the lake is perfect, so Maya and I didn’t have to spend any time panting on our backs. Of course, there was the lake to contend with. Back in our old spot. Woohoo! By now you should know pretty well that I’m not the biggest fan of lakes. Well, any big bodies of water in fact. I don’t mind the ocean as long as I don’t have to go in. For some reason, however, Victoria thinks it’s her job to get me to go into the lake! Even Maya wasn’t a huge fan of this. 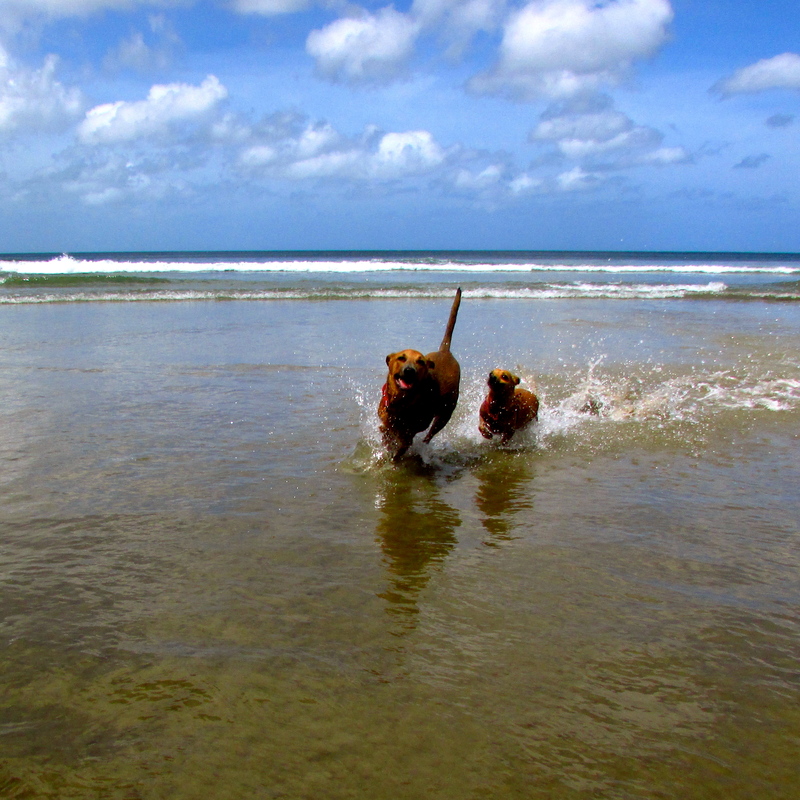 I swam until the humans were satisfied, but I was much happier chasing Maya around the sand. Luckily, My Family gave up on these meaningless efforts pretty quickly, and we settled into a routine of relaxing near the water, not in it. One day, we all had quite a bit more water than we wanted. In Central America, the summer isn’t called summer, but ‘rainy season’. That means it rains… A lot. We haven’t had to deal with that much, but one day on the lake the sky just opened up. It was almost as dark as nighttime, and when the rain started, it just pounded and pounded and seemed like it would never stop. Maya and I were in the Big Camper with Victoria while Jason was working down at the restaurant. All of a sudden we hear this huge WHUMP on top of the camper. Apparently, the tarp thing hanging over the parking area had fallen down, right on top of us! It was even blocking the door, so we couldn’t get out! Jason rushed over and with the help of one of the nice people who worked at the hostel, was able to free us and get everything back in place. That was one wet, muddy day! We also met some really great people there. Humans from all over the world come to the lake for mini-adventures, and a super nice couple from Portland named Tom and Marci hung out with us for a couple of days. 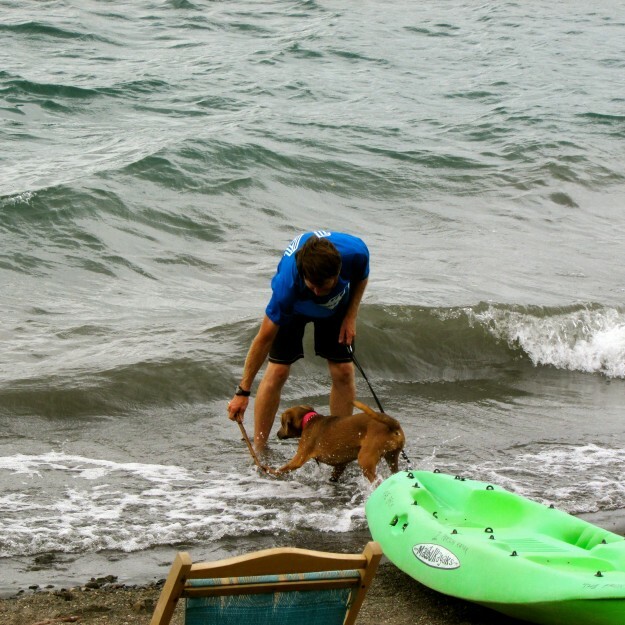 They really love dogs, and Tom even tried to get Maya to go swimming with him! That didn’t work out very well. I did enjoy sitting on their laps, though. And one night, they went swimming in the lake with My Family. Stars were out everywhere, and the beach was so quiet that Maya and I got to run around off leash, even though it was nighttime! I think that was a first. Maya was pretty brave; she went swimming super deep with them. I just ran around on shore barking for them to come back on the sand. What’s with humans and these lakes? They seemed to really like it, though, and when we left the next day we were all a little sad to leave Tom and Marci behind. Tom trying to get Maya to go swimming. She wasn’t having it because she was afraid of the waves. Maya and I loved Marci and Tom! I hope we get to go visit them when we get back to the US. We kept moving north, continuing our quick but crazy fun trip back through Nicaragua. It was a very short drive to Masaya National Park, where we were going to camp for the night. This was way different than any of our other stops in Nicaragua so far. It was very quiet, and there were no other campers, travelers or Adventurers around. Maya and I got left behind in the camper for HOURS while Victoria and Jason hiked up to see the volcano. Volcan Masaya is a ‘live volcano’, which means there’s actually lava and smoke and the chance of an eruption, raining rock and lava all over everything. I sure wouldn’t have picked this as a stop, and I definitely WOULD NOT have hiked right up to the crater’s edge. Like always, I don’t get a vote. Victoria and Jason seemed to enjoy the hike, although they were super tired afterwards. As the sun went down the ants and biting bugs came out by the thousands, so we snuggled up in the camper and went to bed early. 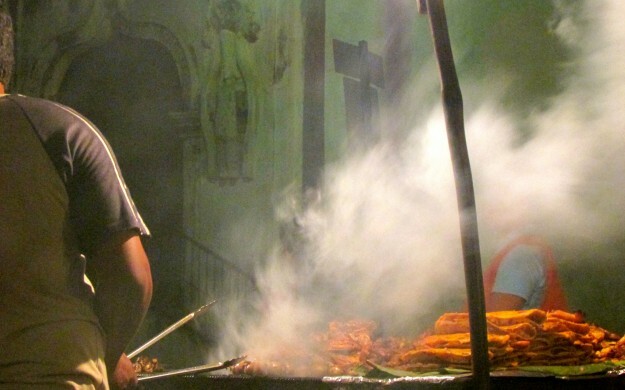 The next day we drove on to our last stop in Nicaragua, a town called Leon. Leon was super hot, super noisy and jam-packed with cars and humans. We drove around for what felt like forever before finding a parking spot in front of Bigfoot Hostel, which was going to be our home for the night. We had a nice room all to ourselves, and all the Adventurers there were super cool. It was pretty special getting to stay in all of these hostels; most places like that don’t like us dogs so much. Maya and I were more than welcome there, so My Family prepped for the next day’s border crossing, and then hung out in the lounge meeting new people. Me and Jamie at the bar. I didn’t get to try the drinks but My Family sure seemed to like them! That night was maybe the most fun yet. We met tons of cool humans, and there weren’t any other dogs staying there, so Maya and I got loads of attention. 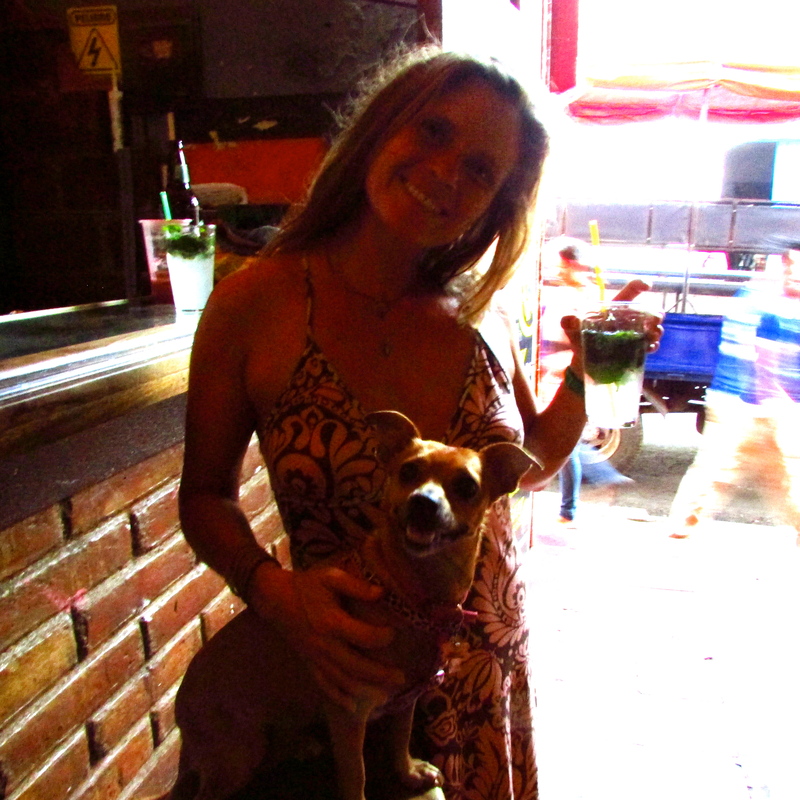 The bar was packed, and Maya and I got to stay out the whole time! It’s pretty rare that we get to party with the Humans. I mean, Maya’s just a puppy, so it’s fine for her to be left home, but I’m a grownup now! We sat in the lounge chatting with all sorts of funny people, went out to the main square to eat delicious street food with our new friends Jamie and Phil (Phil runs an awesome surf camp we want to visit next time), and danced outside of a club. I love to dance, but I think at this point Maya was overtired, so My Family dropped us at home in order to enjoy their last night in this special place. It was hard to see what exactly was cooking but it smelled amazing. Luckily, Victoria is a great sharer so I can tell you it tasted great too! Yep, I’m a Dancing Queen! Well, I’m pretty sure that when we all woke up the next morning Victoria and Jason were regretting that decision. Not only did we have to leave Nicaragua today, but we were also crossing through Honduras and driving all the way to El Salvador! After a long night of fun in the big city, My Family was a little rough around the edges. We packed the Big Truck and headed towards the border, each of us more than a little sad to be leaving Nicaragua behind (except Maya; I still don’t think she thinks much of anything yet!). The last time we were here it was insanely hot, and everyone seemed kinda miserable. We had spent another three weeks in Nicaragua this time around, and it was an absolute blast! The humans were all nice (except for those mean cops who pulled My Family over, but you’ll have to ask them about that! ), the bits of food I got to try were delicious, everywhere we went was beautiful, and we made like a zillion new friends. Although we had to keep moving north now, it was pretty special to be able to go back to some of our favorite places, and check out some of the spots we missed on the way down. The drive to the border was hot, grumpy and slow, but it didn’t take away from our time in this country at all. I sure hope that we make it back again some day, on another of our Big Adventures. PS: To see some of the photos My Family took, head on over to Facebook. PPS: In case you missed my posts about our last trip to Nicaragua, you can catch up here and here!